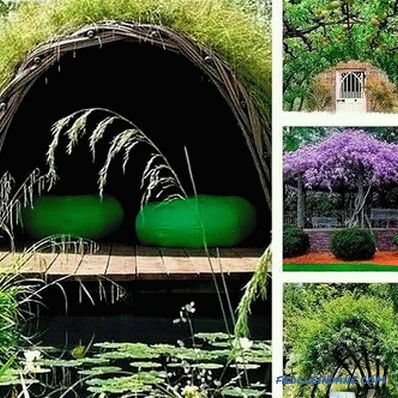 A lively gazebo can be a place for relaxation and a wonderful decoration of the exterior of landscape design. The construction of a live arbor is very different from capital construction. 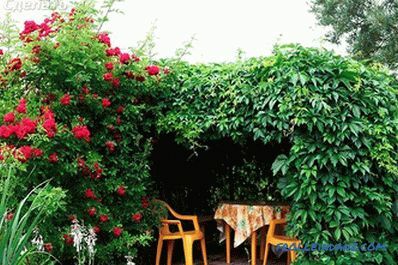 This is due to the fact that for its arrangement not construction materials, but branches and climbing plants are used. In this article, you will learn how to make a live arbor with your own hands. Like any structure, live gazebos have advantages and disadvantages. For example, such constructions will not protect from heavy rain or strong wind, but they are best suited for relaxing in hot summer weather. 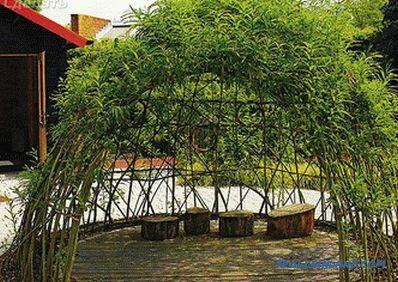 The live gazebo is an environmentally friendly structure, which always has enough fresh air. Here you can hide from the burning sun, plunging into the world of pleasure - socializing with wildlife and friends together with a tasty meal or tea. 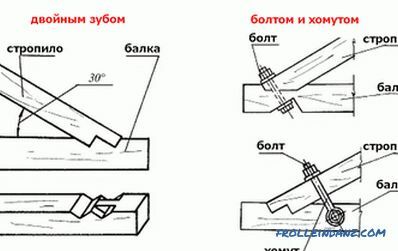 If you are not skilled at assembling heavy structures made of metal or wood, then this is not a problem. When building a live arbor, you will need to plant the plants and, as they develop, combine them into a single whole according to a simple scheme. The main thing is that your arbor be in harmony with the natural component of your backyard plot. Arrangement of a live arbor is not a costly undertaking. 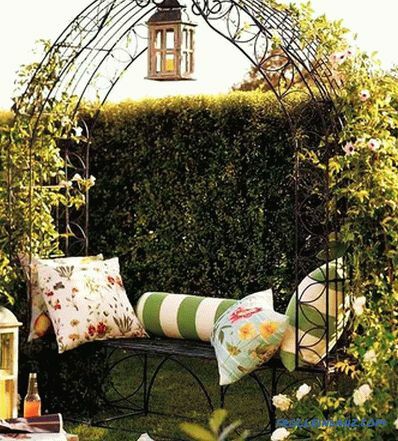 A simple frame for a gazebo is the only thing you need to spend material resources on. Plants you can use those that are on the site. If you want to be more original, you can purchase inexpensive plants on the market. If you have already decided to make a live gazebo, then it's time to determine its installation location. Here it is important to take into account not only personal preferences, but also the requirements of plants, the future or existing design of the site, as well as its own capabilities. 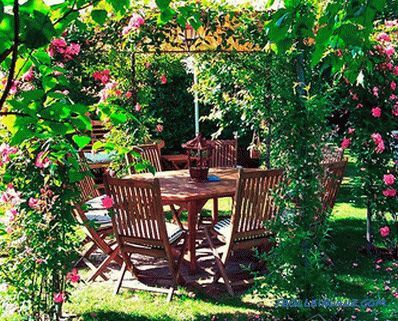 It is best to install a gazebo in the backyard, close to the main buildings. This will allow you to cover one side of the structure from the wind. But, if you can make a strong frame, then there is no point in paying attention to atmospheric phenomena. Anyway, so that green or flowering plants planted around the arbor will take root and delight you with their attractiveness, when choosing a place for a building, it is important to consider their whimsicality. Before you make a live gazebo, decide on the choice of basic materials. If you are not an expert in this matter, it is better to use simple materials without inventing a “bicycle” again. Such structures are made of wood or metal. Here it is important to take into account both the price range and its own material processing capabilities. If you want to be closer to nature while you are in your own living arbor, then it’s better to choose a tree as the basis for the frame. However, if the metal also fits into your understanding of the beautiful, then its use will also be quite appropriate. 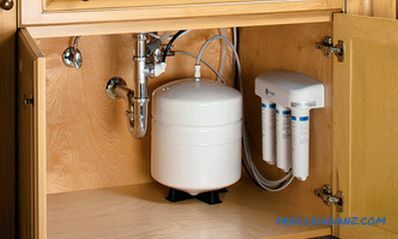 Experts recommend using time-tested, inexpensive materials. 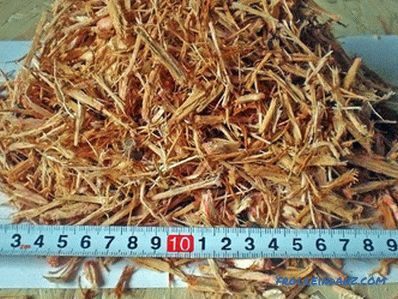 It can be a profile pipe or a wooden bar. If you want a gazebo that you have created to be reliable and durable, then you should first take care of arranging its base. For this, as a rule, the main parts are concreted. Make it easy, even for an apprentice. This will allow you to make a stable arbor base. The frame can be connected around the perimeter of the gazebo, as well as make the base of the roof, which will allow plants to braid the gazebo from all sides. Since in this case the roof is not provided, it will be enough to create a light crate that can hold the branches and stems. A wooden and metal crate, or just a piece of a conventional chain-link mesh, can be used as a frame for the roof of a live arbor. You can connect it to the base with a wire. 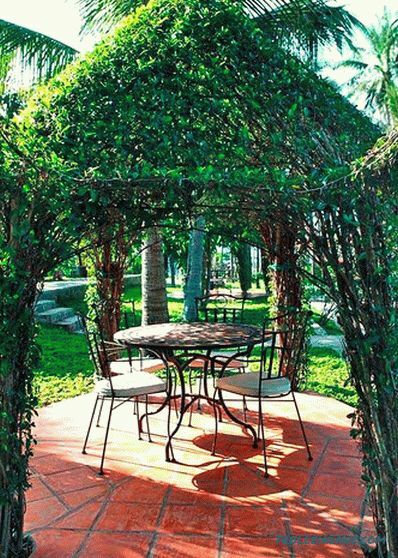 The inner content of the gazebo depends on your personal preferences and understanding of the beautiful. There may be a table with benches or a standard set of country furniture. The main requirement is the convenience for the user and the harmonious combination of furniture with the nature of the gazebo. If you make a frame of a live tree arbor, then it must be painted. This event will protect the frame from rotting and wood damage by parasites. 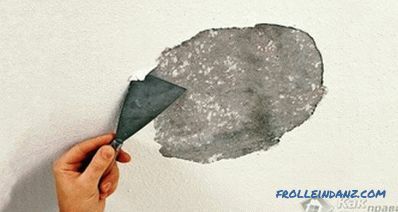 If the frame is made of metal, then it is also better to open it with paint, because you can protect it from corrosion. You can also experiment with design styles. For example, you can use country style to decorate a lively gazebo, which allows you to use different garden tools and old household items. From the old cart you can make a bench or table.If you fix the old rake, then you get an original set for storing cups and towels. A cracked clay pot is suitable for creating a distinctive candlestick. 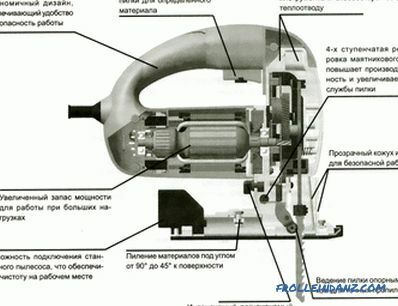 There are a lot of ideas of alterations, and here everything depends on your imagination. The main part of the decor is the selection, planting and formation of plants. This process may seem complicated at first, but when the plants are already planted, and their features are studied and accepted by you, everything will become much simpler. Some owners of homestead land arrange arbors of living trees. This idea looks very original. If you chose climbing plants, then you will need to form the basis of a living arbor. 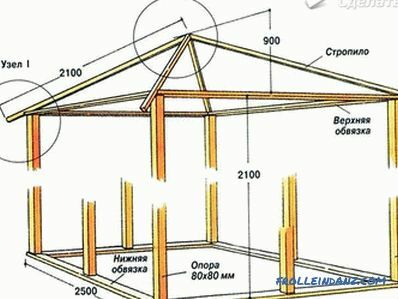 In this case, the branches need to be fixed on the frame and laid on the roof carefully, so as not to injure them. As plants mature, you will need to form a crown, prune it, remove interfering parts and dry branches. Installing a gazebo will take you 1-2 days. Growing plants, of course, will take more time and effort. 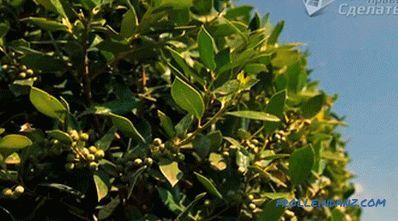 If you are well versed in ornamental plants used for such structures, after 1.5 months you will be able to see a noticeable result. With spikes and without thorns. This could be honeysuckle, hop, Amur and girlish grapes, ivy and climbing roses. 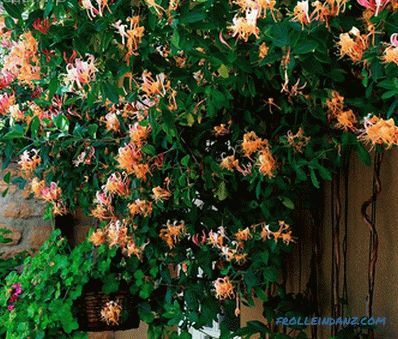 Honeysuckle is an ornamental, actively developing plant. If you plant it correctly, having formed several plant varieties on one gazebo, then your gazebo will bloom from early spring to late autumn. The girlish grape has a red-green color. Unpretentious. Dense fencing of it is formed within 2-3 years. 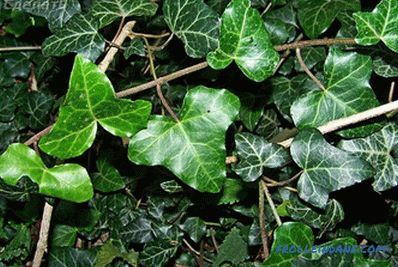 Evergreen ivy is growing rapidly. Unpretentious. However, it takes root only in temperate climates. Capsis is a flowering plant. Orange flowers will delight you from mid-summer to late autumn. 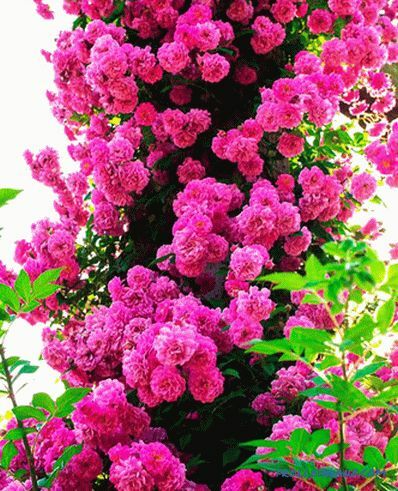 Climbing roses will help you create a romantic atmosphere in the garden. They will be a worthy decoration of any garden. Hops - it grows quickly. Unpretentious. 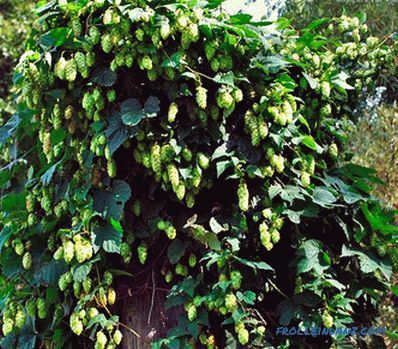 Hop flowers have a specific flavor. 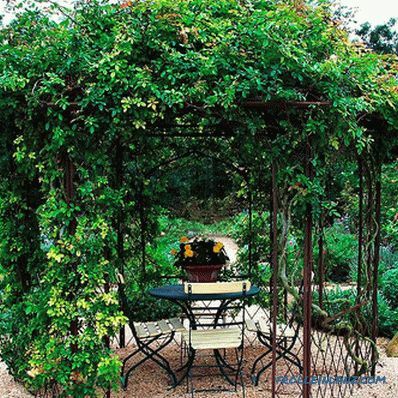 To design a live arbor, you can use one or several types of plants, mixing them at will. It is important to determine the landing pattern. It depends on the specifics of the building and the plants. The scheme can be done independently. Planting plants is best done in autumn or early spring. For the plants to take root, they need to be fertilized, cut and in time to tie up. If you want to make a more fundamental living arbor, then for its decoration you will need trees. You can use willow, maple, birch, apple and others. 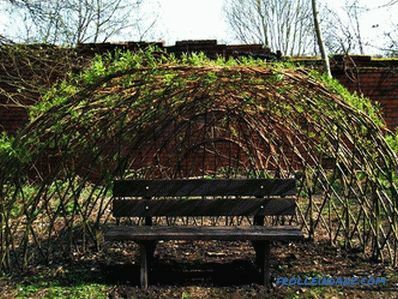 To form a live arbor of trees, plant young saplings and weave their branches and trunks as they grow. Weaving patterns can be very different. The most plastic and forming branches of birch and willow. If you decide to use fruit trees as your decor, then your gazebo will be not only pleasant, but also a “tasty” resting place. But the formation of such an arbor will take you a long time. Yes, and for this you have to pre-acquire special skills. 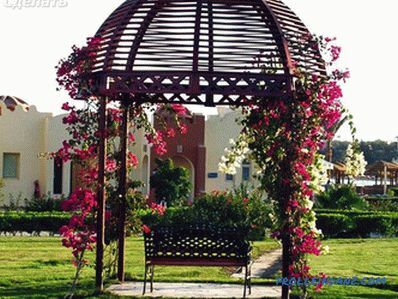 So, applying the above recommendations, you can make a beautiful live gazebo - a place to relax with family and friends. If you still have questions on the topic, then write them at the end of the article. The specialist working on the site will provide you with additional advice. how to make a brazier from metal with your own hands.